Mario Moreno (1911-1993), better known as Cantinflas, was a comedian from Mexico. One time, Charlie Chaplin called Cantinflas the 'funniest man in the world'. Cantinflas did not start his professional life as an entertainer. In fact, it is a little known fact that Cantinflas was in the military and later, also a professional boxer before he dedicated himself to the entertainment world, as a dancer. 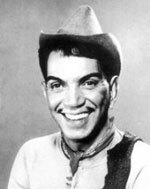 Cantinflas started out performing at a circus in the 1930s. In 1935, he joined the Follies Bergere theater, becoming a popular figure on Mexico's theater scene. He also appeared in a few movies during that time, but it was in 1940, that Cantinflas finally became a movie star, after shooting Ahi Esta El Detalle. The phrase that gave that movie its name became a Cantinflas staple the rest of his career. From there on, Cantinflas went on to make more than 50 feature films, becoming a widely known entertainer and legendary comic all over Latin America and in Spain. Cantinflas went to Hollywood in the 1940s, making two movies, Around the World in Eighty Days and Pepe. His participaton in Around The World garnered him an Oscar nomination. Cantinflas also became President of the Mexican actors' union as well as Secretary of their filmworkers' union. The money he made he invested it in real estate and in the sport of bullfighting. Cantinflas has a star in the Hollywood Walk of Fame and when he died in 1993, the US Senate held a minute of silence to honor his memory. Among the things that endeared him to his public was the way he used to talk during his films: His characters, like El Barrendero, loved to strike up a normal conversation with anyone in the movie, and then complicate the conversation to the point where no one understood what they were talking about, a practice that many of his fans found to be very funny.